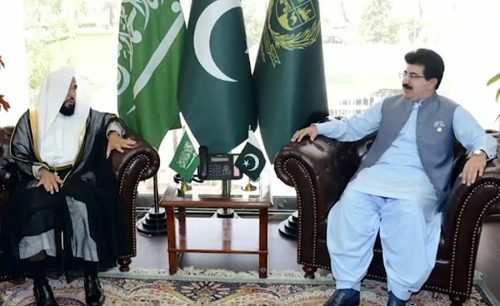 ISLAMABAD (92 News) – Imam-e-Kaaba Sheikh Dr Abdullah Awad Al Juhany has said that Pakistan is the strength of Saudi Arabia and hearts of our people beat together. He said this while talking to President Dr Arif Alvi, during the meeting at Aiwan-e-Sadr in Islamabad on Monday. He also mentioned that the relationship of Pakistan and Saudi Arabia is not merely a diplomatic one but it is relationship based on faith. The Imam-e-Kaaba also said that the relation of Pakistan and Saudi Arabia is symbol of peace, progress and prosperity. The resident said that Pakistan greatly values its relations with the brotherly Kingdom of Saudi Arabia. He said both the countries have shared bonds of history, culture, traditions, faith and values. Recalling the highly successful visit of the Crown Prince His Royal Highness Prince Muhammad Bin Salman to Pakistan, Dr Arif Alvi stated that the crown prince won the hearts of Pakistani people by his generous offer of support to Pakistani community. He also welcomed the Kingdom’s decision of increase in Hajj quota for Pakistan to 200,000 and inclusion of Pakistan in its Road to Mecca initiative. He hoped that the project will be extended to all Pakistani airports for Hajj 2020. The president pointed out that large Pakistani community in Saudi Arabia is a strong people to people bridge between our two brotherly countries. On the other hand, Imam-e-Kaaba Dr Abdullah held separate meetings with Senate Chairman Sadiq Sanjrani and National Assembly Speaker Asad Qaiser and the members of assembly. 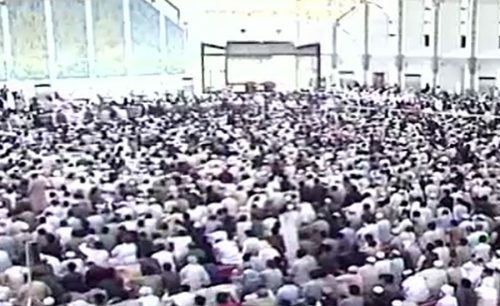 Earlier, Imam-e-Kaaba Sheikh Dr Abdullah Awad Al-Juhany on Friday led the Jummah prayers at Faisal Mosque in Islamabad. The prayers were attended by thousands of people from the twin cities and prominent figures of society hailing from various walks of life. The Imam also delivered sermon before the prayers. IIUI Rector Dr Masoom Yasinzai and President Dr Ahmed Yousif Al-Draiweesh have expressed immense pleasure on the visit of Imam-e-Kaaba, said a press release issued on Thursday. Dr Sheikh Abdullah Awad Al Juhany arrived in Islamabad to Paigham-e-Pakistan Conference on Saturday. He will also meet Pakistan leadership today. He will lead Juma prayer at Faisal Masjid today besides giving sermon. Yesterday, Imam-e-Kaaba Dr Sheikh Abdullah Awad Al Juhany arrived in Islamabad on a seven day visit. He was warmly welcomed by Minister for Religious Affairs Dr Noorul Haq Qadri.